Looking forward to seeing the whole piece~and hey...what kind of super-vitamin do you take?? :) I've been trying to paint my milk house for three weeks! I've thought about painting the massive 'distressed' pine armoire in my living room- any suggestions? Did you try to 'fill in' or sand away imperfections? Did you consider whitewashing, or did you use full strength latex paint? 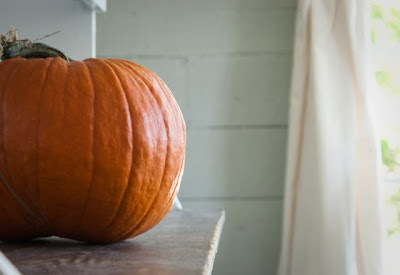 I love the soothing colors, and your pumkin makes me want to get one. It is still 100+ here, not a hint of fall. I miss living on the otherside of the states. I bet that looks lovely with the grey. All this talk of painting is getting me looking at the kitchen walls and cupboards with a speculative eye. How peaceful looking your home seems, with the pale colors everywhere. I wonder if that works especially well in a large space like you have. Is it now going to be called :'the one formely known as the green thing'? I wonder if everyone will continue to refer to it as the green thing? :) Can't wait to see the whole thing. Ooh, show us, show us! I get a very tranquil feeling from the photo. Ever thought of stripping the paint off back to natural wood. Getting a good laugh over here. Growing up, we had a piece of furniture known as the Green Thing. We were SURE that we were the only family that would dub something with such a name! Ours was a small(ish) cupboard that held Highlights Magazines, wrapping paper, church song books, what-not. We had a "green thing" and a "red thing" growing up. :-) Both big old hutches in our 1700's saltbox home.